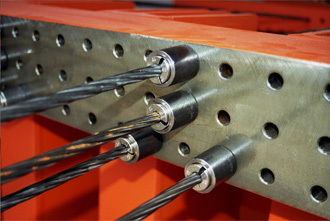 Wedges and barrels are used for fixing the prestressing wires onto the reaction beams. Depending on the type of applications barrels may either be closed or open type. The closed type barrels have the wedges kept in place by a ring with a spring. The choice of wedges and barrels depends on the type and diameter of the prestressing wire to be used.